When I first left the walled-garden of Apple’s iOS I ruminated on the changes that I would have to contend with once the jump had been made. I can say with almost 100% conviction I’d never go back to iOS in its current state. I used Connie’s iPhone and whilst I like the speed of the phone the only thing that I was truly envious of was the camera on the iPhone 6 (and the brand spanking new iPhone 6s, which is a different blog post and a story for a different time) due to the speed of the shutter and the quality of the photos. Ever since the ditching of the iPhone 5 back in 2013 I have compromised on the camera. With the re-review of the HTC One (M8) I noted that it was very impressive (and it was) but over time it slowed right up. Now, with my all-new Google/Huawei Nexus 6P, I’ve returned to the front of the camera pack. In fact, with the 6P it feels like I’ve reached the apex of all the smartphones that have ever been before. I don’t need a computer anymore, I don’t need a laptop anymore, I don’t need a tablet – I just need the Nexus 6P. As you can probably tell, this is an overwhelmingly positive review. As I mentioned in Part I the HTC started off great and utterly started to fail about a year in to its life, before in the past few months just giving up on all hopes of being fast. It provided endless moments of frustration, from losing a video of Joni because the battery dropped from 12% to empty in a matter of moments, to not being able to open a web page for some reason, ending up in a loop of nonsense. That’s not to say that it wasn’t good at what it did – just over time it ran out of space to do anything, and my best attempts to keep it clean and clear whilst also using it as my daily computer was impossibility. Genuinely, the phone (and Connie will confirm this) caused so much frustration and annoyance it was a real issue. That’s not even mentioning the battery. I mention this now to cement me feelings on the HTC that you can read about here. The Nexus 6P is fast. Actually, it’s beyond that – it’s instant. I tap an app or a command and it’s done, no fuss, and without and slowdown. The animations glide and swirl around on the screen well and seamlessly, and the little tricks Google have added (like the momentum on the notification bar) are really nice to see. It’s a great little trick, to have a phone feel like it’s actually responding to your touch when you touch something, and reminds me why phones need to be responsive – even half a second can be too long when you’re actually pressing on the screen and wanting it to happen right then. I was worried that this might be the deal breaker. The 6P has a 5.7’’ screen, 14% longer than the 5’’ HTC and 44% bigger than the iPhone 3G and 4 I used to use. It is certainly tricky to use with one hand, that’s true, but my hands aren’t especially long and I find it fine. Connie on the other hand struggles, which isn’t surprising considering the size of the thing. The best thing I can say about that is that it’s not overly massive, it feels, and despite it looking ginormous next to the HTC and an even older HTC (see the photo) it’s actually really nice in my hand, and I don’t feel like it’s going to slip out of my hand. Not all the time anyway. The big issue is Twitter though – the icon at the top left is impossible to reach with my right thumb, and it’s the “scroll to the top” button for navigation, making it pretty damn hard to use one-handed. Otherwise, the UI is nice and easy to use. I do miss one thing from the iPhone – triple table the home button and it enables “Reachability” which drops the top of the screen to within your finger. That’s a neat trick, and it’d be nice for Google to implement something along those lines here (but I have no idea how). One thing that is a bit tricky is one handed typing. This is easily solved by installing SwiftKey and using their “one sided” keyboard layouts, and allowed me to type one handed with ease. Typing on the phone is amazing actually. On screen keyboards are a bit rubbish, a half-sorted fix for the loss of the actual keys (except for Blackberry, I guess) but here the screen width is enough to make the keyboard wide enough and the keyboard keys large enough to make long-form typing on the 6P a breeze. It’s one of the surprises actually from using it. When I first saw pictures of the phone I was pretty sure I wouldn’t like it. There is a black glass “bulge” at the top of the phone that houses all the good wireless bits and the camera. In reality, the bulge is actually quite a nice feature, making the phone at least look a bit different. It also curves nicely around the back a bit, which is pleasing, and there is no gap between the metal back and the glass. The metal back of the phone is really nice too – in reality, the phone resembles a lot the iPhone 4, one of the best designs Apple have ever came up with and my favourite phone ever (after the Nokia 3210 obviously) so it’s a nice feel in the hand, and doesn’t feel too big. It’s a bit weighty though, which is strange. There is a new reversible fast charging USB thing that I like, and the buttons on the side are in the middle of the side, meaning that they’re really easy to reach. Biggest change for me is the fact that the headphone port is on the top, returning it to where the Nexus and iPhone 4 had it, and unlike the iPhone 5 and HTC One. It’ll take some getting used to, that’s for sure. And there’s a fingerprint scanner. Oh man, this is the best thing ever. It’s on the back, which is a nice idea as it’s exactly where I hold the phone (and I’ve set it up for both index fingers and both middle fingers, for unlocking in the car and as I am holding it) and I don’t think I could go back to phone without it now. It’s so much better than the tap-to-wake feature I loved in the HTC One, but I am still de-learning that gesture admittedly. My sister asked why it was on the back, meaning that I can’t unlock it as it’s sat on the table. I agree that’s a wee annoyance (it’s only an annoyance because the scanner is so damn good) but if it was on the front it’d be a) hard to reach as the phone is quite big and b) make it look exactly like an iPhone 4. So that’s probably a good idea it’s on the back. I have said that I wouldn’t compromise on the camera, like I did with both the Nexus 4 and the HTC One. The thing is, the Nexus 6P has a great reviewed camera, but the thing is I’ve not really had a chance to use it much. I took some videos of Joni in the dark and the results were pretty good. The photos are good too, so far, but the jury is still out. I’m not sure if I like the camera software, as the HTC camera software whilst it was slow was very impressive for settings. I can’t even pause video recording during a video which is strange, so I’m looking at a replacement app. But the hardware is great. One feature I do really like is the double-press of the wake button to launch the camera which makes it super-fast. It’s better than HTC’s “rotate to landscape and press capture” which never actually worked 100% of the time. I do not like the fact that the button used to activate the camera also turns it off again – I feel like it should also capture the photo, and I’ve already done that a few times now. There are two things I like about the battery. The first is that it charges so quickly – full charge in 1 hour and 30 mins which is brilliant. It also lasts a lot longer than the HTC, getting to at least 10pm every day even with about 4 hours of screen on time. The biggest boon is the new Doze mode that essentially drops battery usage to zero if the phone is sitting there doing nothing. I charge the phone when i get home and overnight it sits on my bedside table and sips juice, losing at most 3% in 8 hours of doing nothing, and a few messages have come through in that time (thanks, friends who live all over the world). I wish it lasted longer though. It’s better than the HTC mind you, but I am thinking of starting to use our wee iPod Nano for music again, which might be a good idea to add some of my favourite albums to for work to save battery if I am listening a lot during the day. - The OS is nice, though there are things I miss from the HTC system. - The speakers are as loud, if not louder, than the HTC ones, which is a relief. This list is small. 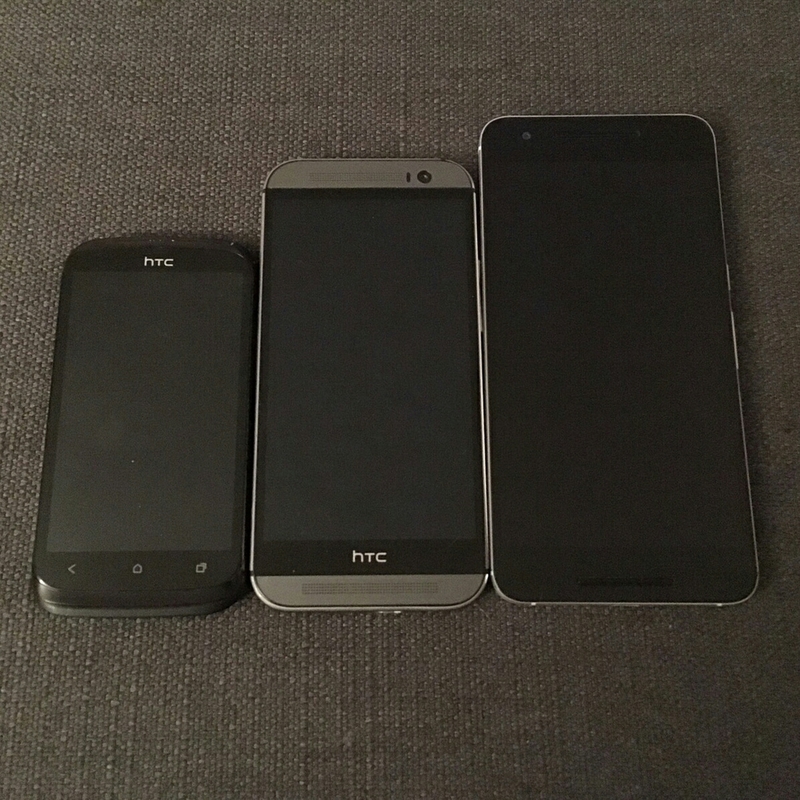 Very small compared to the HTC and Nexus 4. - The screen rotation function appears to be a bit slow to react, oddly. - The battery feels like it should be a lot better. Maybe it will get there. - The LED can’t be adequately customised, even with Light Flow, as it disrupts the screen and the notifications. It’s a shame I can’t have the different colours, but it’s nice to have any light notification on it for when something’s came through. - If I am being super critical, the screen is big. I like it a lot as I’ve said but it’s just maybe almost on the big side a few times. And I’ve almost dropped it once due to its size. - I used the Fitbit application daily, and it’s not built into the 6P. Instead, it used Google Fit, which seems fine. I use it for step counting, so we will see. I wonder if the Fitbit application will work with the 6P – I’ve not checked. - The HTC Quick Settings were better than the pure Android ones, which is a shame. - I miss the HTC Lock Screen actually. It had four icons on the bottom that allowed for quick launch when swiped. I know, the fingerprint thing bypasses that (I don’t even look at the lock screen anymore really) but it was nice to launch WhatsApp from there. I am immensely happy with the 6P. It’s a really powerful device that I feel is more tablet than phone, and I’m happy with that. I never thought I’d say this, but I am a Big Screen Convert.